2018 and the Trump presidency is a time that will be in history books. The news of each day comes at us with breakneck speed. Everyday is a big BREAKING NEWS day. Some people are into it, others turn it off and unfortunately most just lose track. The events happening in our world today are important and life changing. It needs to be documented and recorded. 2018 is also the year of being transparent. If transparency doesn’t happen voluntarily it will be forced out through leaks, investigative reporting or good old social media. People are watching and peeling under the layers to see what is inside and underneath. The title of this project is “Forced Transparency” because whether one chooses to be transparent or not, this is the year to be exposed. 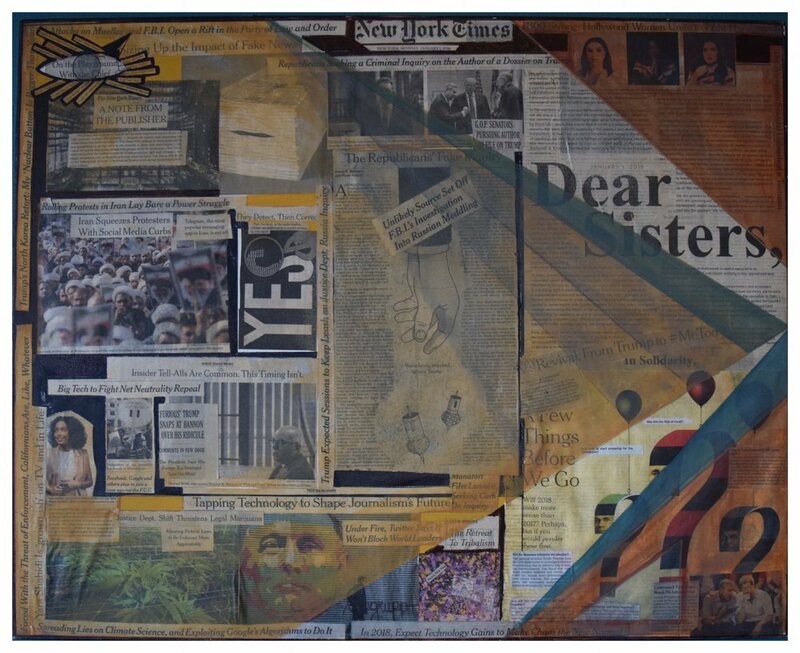 Forced Transparency 2018 is mixed media collage art using The New York Times newspaper as its source. Each piece, 52 in total, is dated and represents one week of news starting on January 1, 2018. With the use of paper and paint, layers are created; words and images are seen through transparent colors. Forced Transparency is also about opening myself up as an artist as we take a closer look at this year’s news, events and our shared history. Let’s look back at this historic year through my eyes. Welcome to Forced Transparency. To see more click on the Instagram link below and follow me!